Your Peace dollar values are a lot higher today than just a year ago. The market is expanding, the price of silver is up and so is the value of your coins. Minimum value is $17.87 each. Even though Peace dollars were minted for only a short span of years, it is a popular series with collectors and does have its share of rarities. 1921 the first year of issue and 1928 are the two rare dates you are hoping to find. Starting values $57 and $118 respectively. Most of the value is found in the higher "Grades", better condition coins. Uncirculated or also known as Mint State coins are the most eagerly sought. The uncirculated Peace silver dollar pictured is an example of a very desirable coin. Condition is key to values, see more about condition and how to "Grade" your Peace dollars below. The most lofty Peace dollar values are reserved for "Uncirculated" coins. With just a few rare dates, the condition of your coin is a significant factor. The 1934-S is an interesting coin and exposes an important fact about your coins. 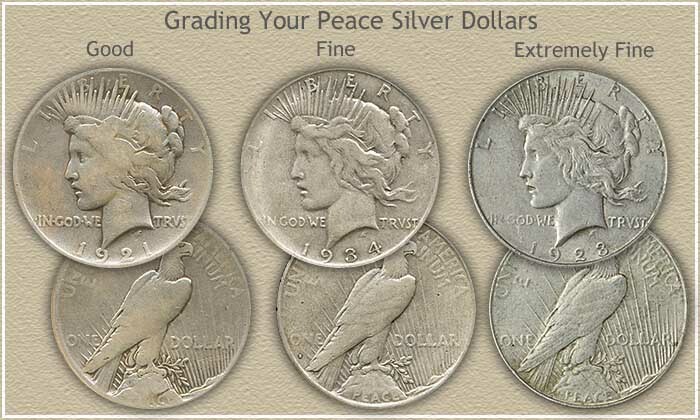 How well preserved and how nice your coins look has a huge impact on your Peace dollar values. Using the 1934-S as an example, in "Good" condition a rather worn coin, it is worth $28.82 . In slightly better condition $32.73 . Jump to a coin that has no signs of wear, is bright and appealing, now the value climbs to $2,107. True, not all coins have as large a range in value as they improve in condition. It points to how important the "Grade" of our coin has become. Collectors and dealers judge the condition of all coins and then determine value. Line your silver dollars up from the most worn to the least. 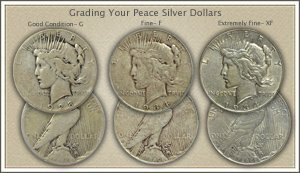 Compare them to the image below, it shows how to grade Peace silver dollars. Look closely at the hair detail of Liberty and feather detail of the eagle. On the higher grade coins only a trace of wear shows. Leaving most of the detail sharp. Using the 1934-S again as an example. In Uncirculated condition it is very rare and worth over $2,107. Uncirculated is a coin that has never circulated, is bright with mint luster and sharp with no wear. In this case when your Peace dollar values are very high, subtle differences have a large effect. 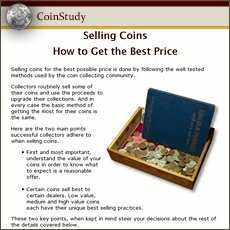 If you believe any of your coins are of a higher grade and value and not sure, help is available. In depth video, still images and descriptions Grading Peace Silver Dollars | Video details a step by step process to judge condition and assign a grade. Check a few rare coin dealers listings, look for those offering Peace silver dollars similar to yours. Their higher priced listings usually include a notation of the NGC or PCGS assigned grade. Additionally, these coin dealers are potential buyers of your coins. Rare dates, mintmarks and condition. Know what to look for and you discover your true Peace dollar values. Rare dates, 1921, 1928 are easy to recognize, they stand out on the charts. Secondly, find the mintmarks. Mintmarks, a small "D" and "S" are located on the reverse just below ONE close to the tail feathers. 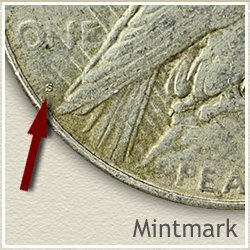 No mintmark represents the Philadelphia mint, the "D" is used by the Denver mint and the "S" indicates the San Francisco mint produced the coin. Rather small to see, a magnifying glass is helpful. Condition is the third element to value. Collectors want the finest Peace dollars for their collections and are willing to pay. Your Peace dollar values are driven by this demand. Take a second look at your coins, judge their condition carefully. You are more likely to find a higher condition coin than a rare date. Discover their complete value. Historically Peace dollar values increase yearly. Consider your group of coins as the beginning of a coin collection. The start of an enjoyable and rewarding hobby. If that is not for you, one successful approach is to sell all your coins and use some of the proceeds to buy one nice rare coin. A blazing gem Peace Dollar. The one you were hoping to find in the box. Pass the thrill of a rare coin on to your children. Condition and grade of Peace dollars is a major factor to value. Judging and grading your silver dollar is detailed with video, large images and in-depth descriptions. Identify the subtle points to the different grades and understand what separates a premium collectable from a silver bullion value dollar. 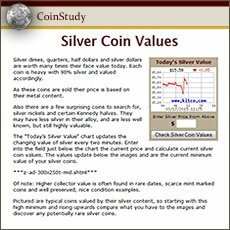 Print the Coin Values Worksheet - lin in navigation column - to list your Peace silver dollars and record their values. Should you decide to sell... use the worksheet as an invoice and packing slip when sending coins through the mail to dealers. It indicates you have done your coin values homework.